Have you ever wanted to make cooking rice easier and get a more consistent texture ? Get perfect results every time:- try the Kitchen Genie Rice Cooker & Steamer -10 Cup. Cooking rice is usually time consuming and requires constant attention to ensure the rice is cooked properly, and not burnt. An electric rice cooker automates the process by controlling the heat and timing. This means a heating element is freed up on the cooking range that would otherwise be occupied for rice cooking. 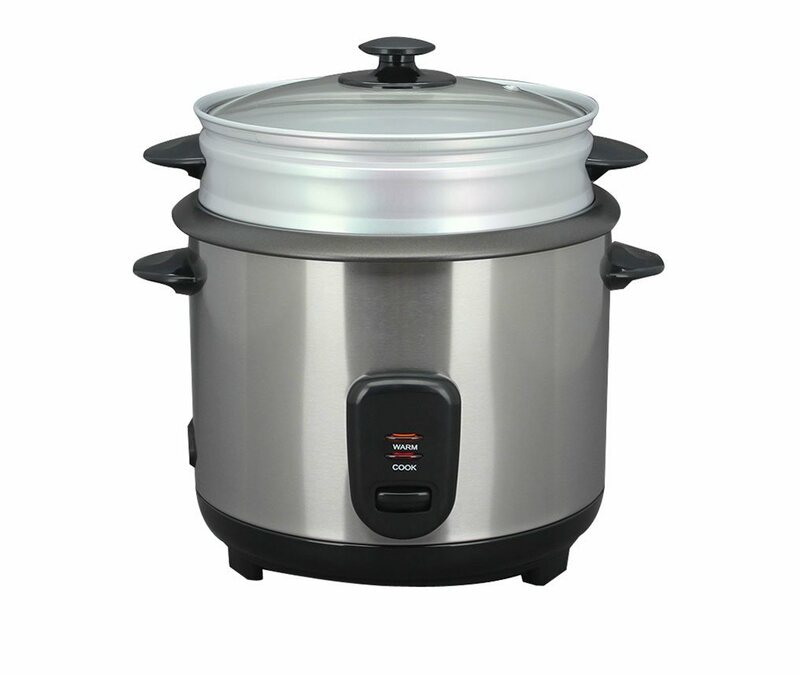 A rice cooker does not necessarily speed up the cooking time but it does reduces the cook’s involvement in the process, freeing the cook up to prepare and cook other ingredients. Once you have a rice cooker you merely have to measure the rice and add the correct amount of water. Inside the inner bowl there are usually graded marks etched on to indicate the required quantities of rice. Once the appliance is set to cook, the rice will be cooked with little further attention. If you follow the instructions, it produces the right texture and perfect results every time. Never worry about stirring, burning or monitoring again. The steamer on top adds flexibility particularly with cooking vegetables. The Kitchen Genie Rice Cooker range starts at the handy Kitchen Genie Rice Cooker & Steamer- 10 cup model which is 1.8 Litre, then the medium large family model at 2.8 Litre -16 cups and goes up to the much larger big family model of 5.6 Litre -45 cups. The model shown is the 1.8 Litre – 10 cup Kitchen Genie rice cooker with its unique built in aluminium steamer. Buying the entry level Kitchen Genie Rice Cooker & Steamer will prove an invaluable addition to the home. Holds up to 10 cups of rice. With 1 x paddle and 1 x cup.